LT ia a prestigious stock, and I have fond memories of this one. This was one of my earliest winners, way back in 1991/2.One of our friends has been asking about this stock and so let us see how this one looks like now. 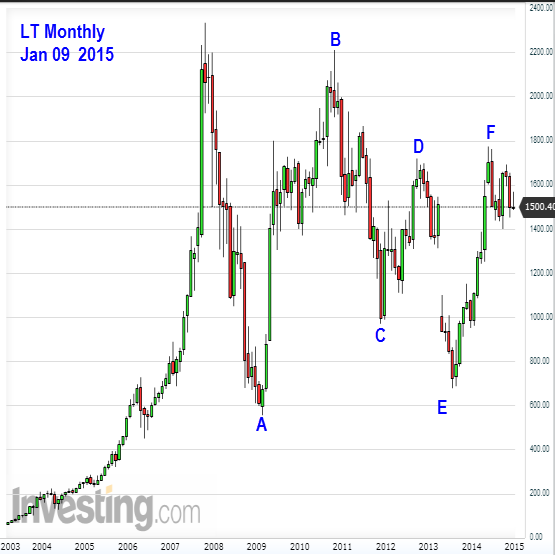 Technically, LT is in the last wave of the diametric which had started from 2008 Jan.Wave G is slated to bottom out this 2015 and a new bull run to start. That is when we should hop on to this band wagon, because Infrastructure could be in favour in 2016. 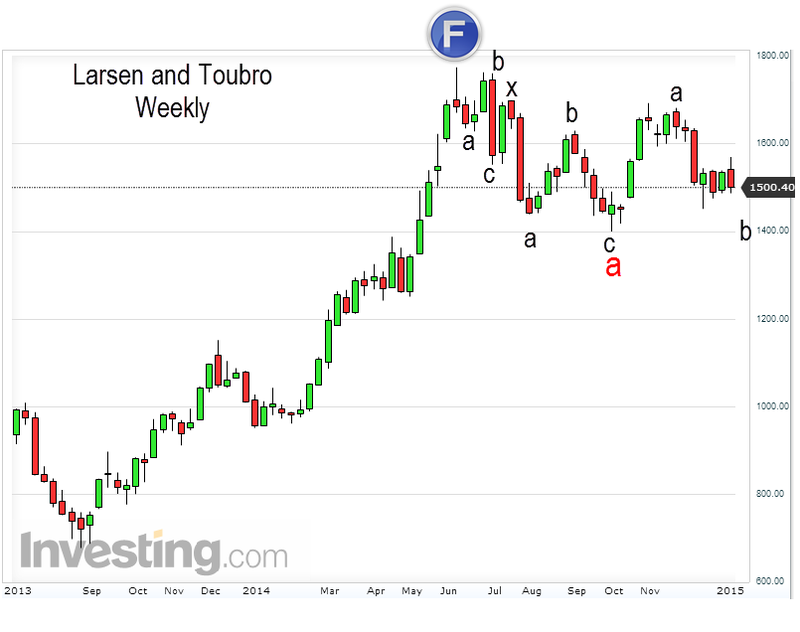 We get a better picture with the weekly chart.We expect wave b to drop down some more and then wave c of b to start up. When that completes, wave b would be complete and then wave c down should start in an abc fashion. When wave c completes, entire wave G also would be complete. So the first move medium term could be down. Daily also gives a similar picture. Maximum downside could be by 1350. That could be a good long term buy. 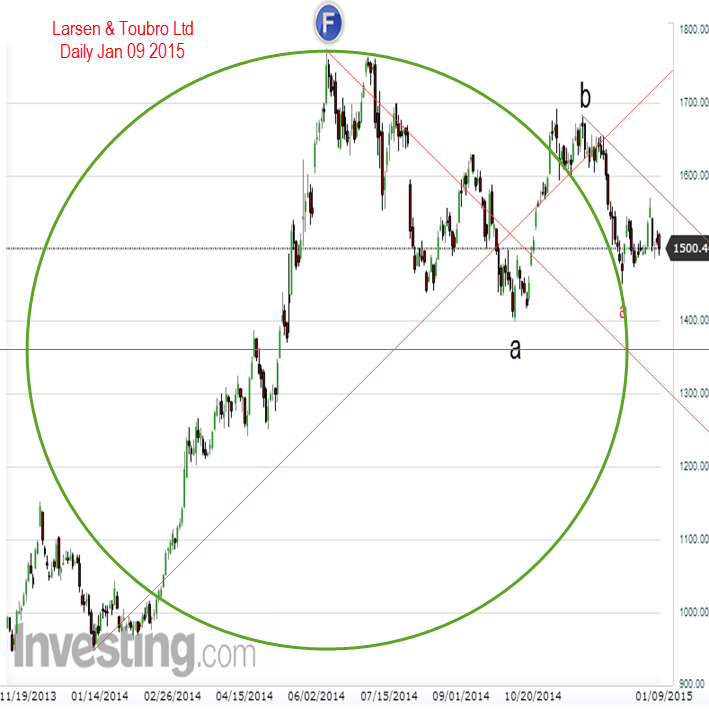 LT also is a good medium term trade because it shows legs on both side.. up and down. Aquarius is the 8th house for LT. First Mars, then Venus, Sun and finally Mercury will pass through Aquarius in the next 2 to 3 months. That is a time of test for the stock.From March to August it is Jupiter and that is when this stock will start to accelerate. We shall periodically review this stock. It is a good one to own, because of powerful planets in the 11th and 2nd houses. I had replied. Please check your mail box. Could you give your latest views regarding EW count ?